How are Google, Facebook, Twitter, and other major tech companies protecting your digital rights? No so well, according to a new study. Google scored a 65 out of 100 in the inaugural Ranking Digital rights Corporate Accountability Index, which you might think sounds pretty bad. But Google’s 65%, a ‘D’ on the grade scale with which you’re likely familiar, is the best of the bunch. 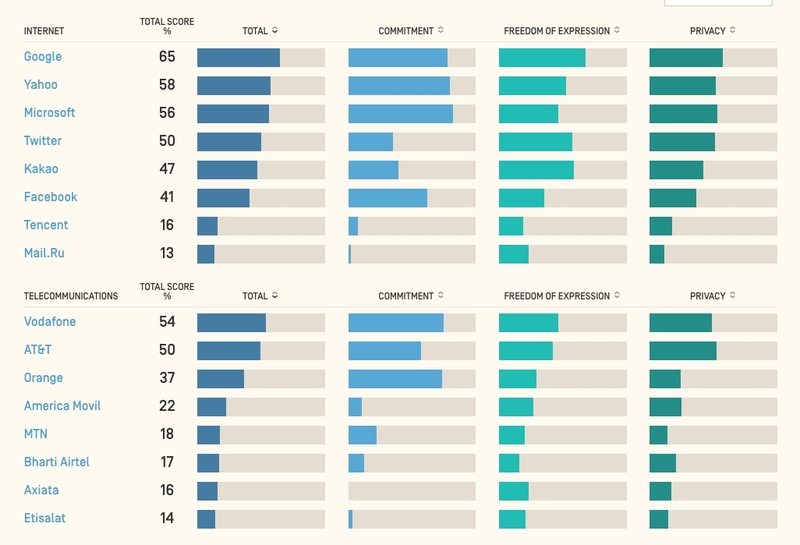 The Ranking Digital Rights initiative’s first Corporate Accountability Index looked at 16 of the world’s most powerful tech companies – eight internet giants and eight telecommunications companies. The index evaluates each company on on 31 separate criteria in three main categories – commitment, freedom of expressions, and privacy. Does the company commit to provide meaningful notice and documentation to users when it changes its Terms of Service? Does the company explain the circumstances under which it may restrict or deny users from accessing the service? If the company restricts content or access, does it disclose how it notifies users? Does the company disclose what user information it collects, how it collects this information, and why? Does the company disclose if and how it shares user information with third parties? In aggregate scoring, Google performed the best with a 65. Yahoo, Microsoft, and Twitter followed that with scores of 58, 56, and 50, respectively. Facebook mustered at 41. But even the “winners” aren’t really winners. On the bright side, every company researched was at least doing something, even if that something is not enough.